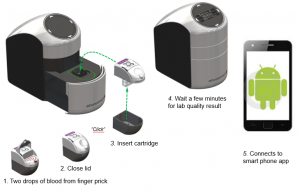 Uses proprietary micro-capillary technology to passively separate finger prick volumes of blood into cells and plasma. This allows the performance of standard assays, such as lipid panels, from small blood volumes in a low cost device. In contrast, competitors utilise either low quality paper chromatography technology or require costly membrane chemistry, pump systems or centrifugation steps. Matches gold standard device for Accuracy e.g. 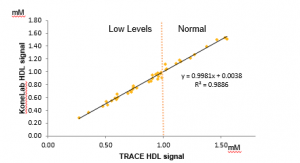 HDL cholesterol, part of the lipid panel. Results replicated in 200 subjects. and uploaded to smart phone. Almost any standard assay can be added to the platform in ~6 months.Late stage pipeline: full lipid panel, HbA1c and C reactive protein (CRP). Many Others possible e.g. : assays for biological drugs and anti-drug antibodies, Potassium, Platelet aggregation, Melatonin, Vitamin D, Cortisol and Testosterone. Atonomics are seeking additional partners in the companion diagnostics, pharmacy testing, telemedicine and consumer lifestyle markets.